Close view of entrance porch of the Gadarmal Temple, Pathari, Bhopal State. bl.uk > Online Gallery Home	> Online exhibitions	> Asia, Pacific and Africa Collections	> Close view of entrance porch of the Gadarmal Temple, Pathari, Bhopal State. 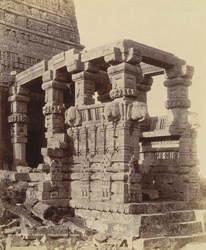 Photograph of a entrance porch of the Gadarmal temple at Pathari taken by Joseph David Beglar c.1871-72 for the Archaeological Survey of India. Pathari is situated in the modern state of Madhya Pradesh. Occupation of the site dates back at least as far as the Gupta period and centuries of settlement have left large numbers of ruined buildings all around the city. Of these, the Gadarmal temple is the most substantial and according to Beglar, the earliest parts can be dated to before the eight century. It stands about two miles to the south east of the modern town. The temple is surrounded by a series of courtyards, with seven subordinate shrines symmetrically placed around a central cell. In this photograph we can view the tower in a ruinous condition that stands over the main shrine. This central area is oblong in shape and housed a brahmanical image, possibly a linga.